Like other elements of the country’s culture, Israeli music has long been profoundly shaped by its military history. From folk dancing to fusion rap, songs are suffused with a unique mix of cynicism and optimism, tragic loss and hope for the future. Israel has been fighting an ongoing war for survival since its inception, and its popular culture has always reflected this. The dream of living in peace and security in the Jewish homeland is one that many believed was finally being realized in May 1948. This dream, however, has remained just that, as Israel has struggled with sustaining a Jewish democracy in the face of repeated attacks by Arab states and incessant Palestinian terrorism. This tension lies at the heart of Israel’s national culture: The desire for peace and the unavoidable necessity of defensive military action. 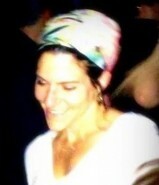 As such, it is an inescapable feature of Israeli popular music. The opposing slogans used for the song paint an ironic yet clear picture of the tensions plaguing Israelis. When it was released in 2004, Israelis were reeling from years of suicide bombings. With these horrors still fresh, Prime Minister Ariel Sharon announced his plan to dismantle Israeli settlements in Gaza. The disengagement remains one of the most controversial decisions in Israeli history. Many believe the withdrawal has weakened Israel and placed her at greater risk. Others believe the withdrawal is irrelevant, and the continuing conflict is due to Israel’s failure to engender greater cooperation with the Palestinians. Man, why is your heart cold as ice? Are you enjoying being a murderer? Why would you talk like that? This type of hyperbole is unpopular with many Israelis, who increasingly view the peace process as an accursed rock of Sisyphus: No matter how often Israel pushes towards peace, the situation inevitably rolls back into violence and turmoil. Resolving the conflict with the Palestinians has eluded Israel, and this frustration is the flipside of HaDag Nachash’s dovish lyrics. They want to destroy me. We’re nurturing and arming those who hate us. The feud between HaDag Nachash and Subliminal mirrors the push-pull dynamic many Israelis feel in regard to the never-ending conflict with the Palestinians. Strangled between the rock of war and the hard place of peace, Israel sings this complex split personality in its popular music. The cognitive dissonance of feeling obligated to fight while abhorring violence is a large part of what it means to be Israeli. As such, the conflict between these two values beats a low bass line beneath the surface of popular culture. Every genre has variations on this theme, but in music the dissonance is especially poignant. 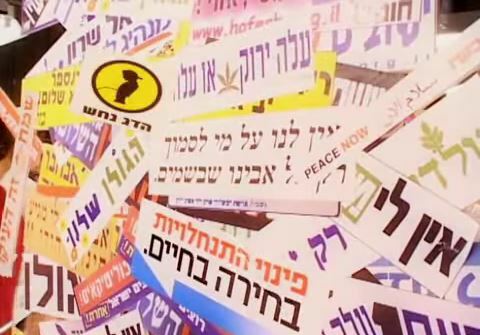 Some of the slogans in “The Sticker Song” still decorate Israeli cars ten years after its release. Standing in endless Tel Aviv traffic, drivers rushing to get home or to work don’t even notice the contradictory subliminal messages; yet these contradictions are essential to what it means to be Israeli. The popular music that characterizes “Israeliness”—to borrow an expression from ethnomusicologist Motti Regev—cannot be separated from the ongoing corrosive war with the Palestinians. Israelis are hyper-aware of the matzav (“situation,” the colloquial term used to describe the conflict). This creates a highly politicized culture in which the entire national consciousness is united by a near-pathological obsession with the conflict. 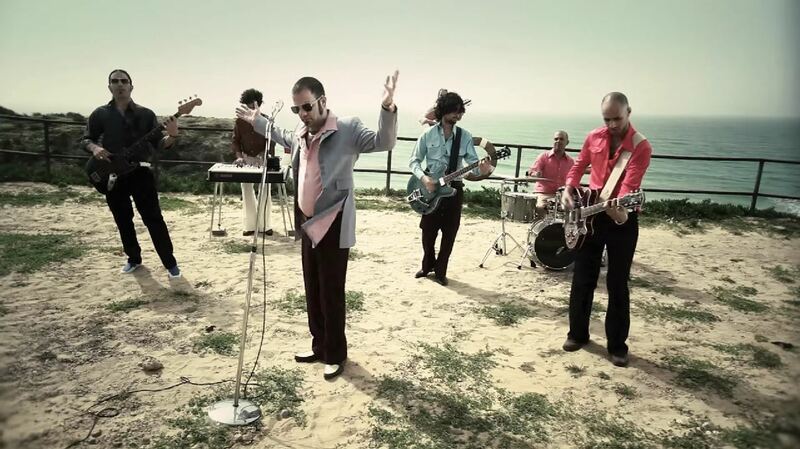 Naturally, Israeli popular music is just as political. An added dimension to the politicization of Israeli music is mandatory army service. Israel’s armed forces are estimated to number close to 800,000, including active and reserve soldiers. In a country of seven million, this means nearly everyone in the country is, has been, or is related to a soldier. Inevitably, the overwhelming number of Israeli recording artists were or still are soldiers, as are most listeners. The shared experience of army service in Israel is not only one of patriotism, chest pounding, or victory dances. It is also one of profound sadness. It sings about the loss that remains once the dust has settled. Everyone has lost someone. Some have even lost parts of themselves. Being a soldier, loving a soldier, or losing a soldier is the great unifier; everyone sings along, the refrain achingly familiar. 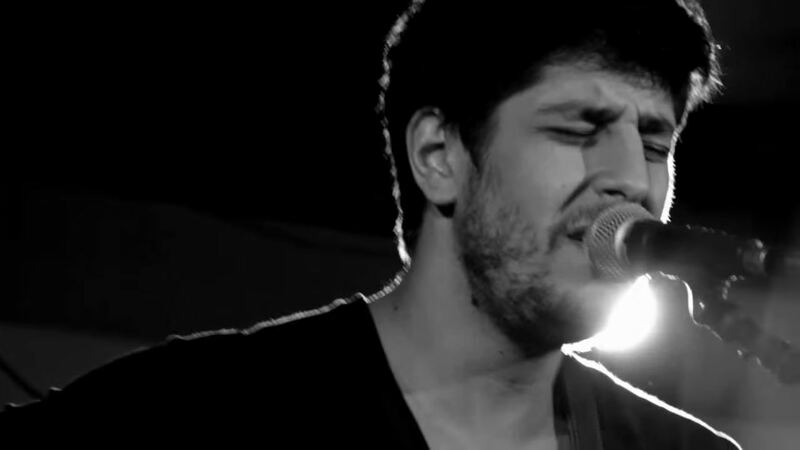 In his recently released song “It’s Over,” Idan Amedi sings in the voice of a soldier being released from army service, expressing the ambivalence felt by most Israelis who are compelled to fight for peace and security. Israel’s deeply ingrained military culture and the trauma of endless conflict demarcates the space within which music can be heard. The music is about the conflict and the conflict appropriates the music—the two cannot be separated. Specific periods in Israel’s brief yet turbulent history have inspired the composition of specific songs, and others have turned certain songs into anthems. Every period in Israel’s short and tragically eventful history has been marked by the sudden popularity of a song that succeeded in capturing the nation’s ears and hearts. Each pivotal moment has a soundtrack that every Israeli recognizes as being associated with that time. Between 1948 and 1967, Israel stood on shaky ground. Massive waves of immigration from Europe and the Arab states, ongoing conflict with Palestinian Arabs, the 1956 Sinai War, and the challenge of developing a national culture kept Israel very busy. Its early cultural development was guided by European-style nationalism and socialism, and repudiated Diaspora Jewish ghettoization and vulnerability. The image of the warrior-pioneer became idiomatic of what it meant to be Israeli, and in turn generated uniquely Israeli music. An integral aspect of this early Israeli music was the attempt to spread Modern Hebrew among thousands of new immigrants. This effort was manifested in shirei eretz Yisrael (“songs of the Land of Israel”) and shira b’tzibur (“communal singing”). Every Israeli knows these songs. New Israelis learn them and old Israelis hum them unconsciously. Children hear them in school and would-be stars sing them on reality television shows. Their familiarity remains an essential part of Israeli culture, and even today they are frequently sung communally. 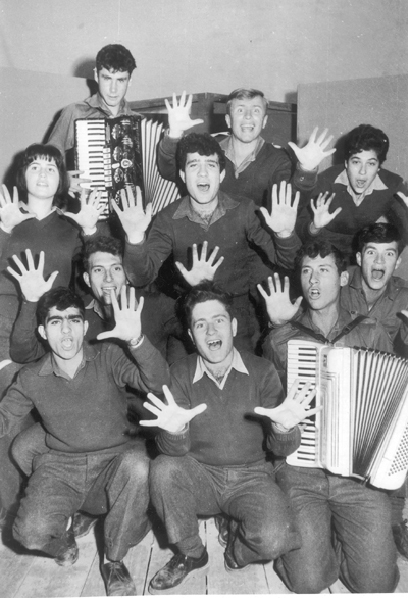 Many of Israel’s early folk songs were sung by military ensembles. Since the 1950s, these groups of enlisted soldier-singers have been integral in disseminating Israel’s national culture through music. The early music of the lehakot tzvayot (“army bands”) focused on comradeship, hope for peace, and loss on the battlefield. These themes have remained constant in Israeli music. Created by a defensive army containing a large number of Holocaust survivors, this music of strength, determination, and unity helped cement Israel’s self-image. In “Song of the Comrades,” for example, the Nachal army unit sang of a soldiers’ obligation to remember the fallen. Military songs became immensely popular after 1967 as Israel grappled with its miraculous but costly victory in the Six-Day War. In particular, Dan Almagor’s heartbreaking “Ballad of the Medic” had an enormous impact. It tells the story of a brave medic killed in battle while treating a wounded soldier. The song is in the form of a dialogue between the soldier and the medic. The soldier begs the medic to leave him behind, and the medic refuses even as he too is wounded. In the final stanza, the medic no longer responds as the words “my brother, my brother” are cried out. The song, emotionally rendered by singer Yehoram Gaon, elicited such a strong response from listeners that the family of a fallen medic requested that Galei Tzahal, the IDF radio network, desist from airing it. Out of respect for the family, the network complied. It has not been played on the radio since, and even today is only heard on Memorial Day and induction ceremonies for army medical units. The euphoria of victory in 1967, especially in Jerusalem, helped solidify Israel’s self-perception as a nation that fights valiantly in defense of the Jewish homeland. In this context, one song in particular became legendary: “Jerusalem of Gold,” now widely considered the greatest Israeli song ever written. To this day, Naomi Shemer’s words evoke the shared memory of Jerusalem’s reunification. Even before the war, its impact was immense. Premiered at an Israeli song competition just weeks before the fighting broke out, the reaction was so electric that the song had to be sung twice in order to placate the crowd. During the fighting, the paratroopers who liberated the Old City sang Shemer’s words in battle. After the war, she added the final verse in honor of the newly unified Jerusalem. The chorus evokes a vivid image of young soldiers gazing at the Western Wall, weeping in the knowledge that they are the first Jews in 2,000 years to pray there under Jewish sovereignty. This euphoria was short-lived. The victory did not bring the peace Israelis expected. It was followed immediately by the War of Attrition with Egypt and then the Yom Kippur War in 1973, perhaps the most painful of all Israel’s battles. The sudden offensive caught Israel completely by surprise and, with over 2,500 casualties, gouged a deep wound in the Israeli collective psyche. Gone was the sense of infallibility. Gone was the glory and heroism of battle. In its place, the desire for a sustainable peace gained strength. All that we ask for, let it be. All that we seek, let it be. From 1973 until 1987, Israel remained a country that longed for peace, but was continuously compelled to defend itself. Hopes were raised in 1979 with the signing of the peace treaty with Egypt, and despite ongoing Palestinian terrorism and the 1982 Israeli invasion of Lebanon in order to stop it, the nation remained optimistic that a final, lasting peace was possible. But hope took a massive blow with the outbreak of the first intifada. From 1987 to 1993, including the Gulf War in 1991 when Saddam Hussein turned his Scud missiles on Israel, the nation struggled with how to make peace with an increasingly violent Palestinian population. Ehud Manor’s “I Have No Other Country” became one of the most indelible anthems of this period, and is still sung today at public events formal and informal. It was written after Manor’s brother Yehuda died in battle in 1968, but was only recorded and broadcast in 1982. It became popular in the late ‘80s and has maintained its status ever since. The keening, mournful melody speaks of a love of Israel despite the pain and loss of never-ending struggle. A different side of this period was fostered by Israel’s acceptance by the Eurovision song contest. The national pride that accompanied this recognition spawned numerous patriotic, lighthearted songs that became immensely popular with the Israeli public. “Hallelujah” (which won first place in 1979), “Hora” (which took second place in 1982), and “Here” (third place in 1991) became staples of the Israeli music scene. Invariably catchy, these songs have several themes in common: A love of life, pride in Israel, and a deep hope for peace. Ofra Haza’s performance of “Chai” (“Alive”), also by Ehud Manor, at Eurovision in 1983 is emblematic of the genre. Alive, alive, alive—Yes, I’m still alive! This hopeful spirit was strengthened by the Oslo Accords in 1993. But it was quickly dashed. For barely two years, Prime Minister Yitzhak Rabin forged ahead with his peace plan as terrorists continued to strike Israeli civilians. Following the signing of the 1994 peace treaty with Jordan, Rabin took another big step toward Palestinian self-determination despite the ongoing violence. This process was stopped in its tracks and a fundamental shift in Israeli national identity occurred when Rabin was assassinated by an opponent of the accords. Originally featured in the beloved 1978 film HaLahaka (“The Band”), “Shir Lashalom” (“A Song to Peace”) is now forever associated with Rabin’s assassination. 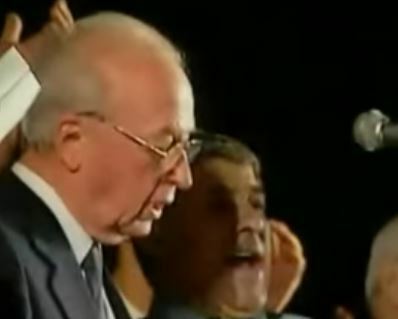 Minutes before he was killed leaving a Tel Aviv peace rally, Rabin sang the song from the podium together with Shimon Peres and thousands of supporters. The lyrics were later found folded in Rabin’s shirt pocket, soaked in his blood. Written by Yaakov Rotblit and inspired by the American peace movement, the lyrics ask Israel to bury its dead, leave resentment and fear behind, and move forward towards its abiding dream of peace. Though it had become popular during the Oslo period, its hopeful optimism has become tarnished by the terrorism that has haunted Israel ever since. It is still sung every year on the anniversary of Rabin’s death, as Israelis mourn for both Rabin and his shattered dreams. The annual performance of “A Song to Peace” has become sadly ironic as Israel suffers one war after another, one terror attack after another. Israel has become increasingly polarized over the Palestinian conflict since Rabin’s murder. The terrifying violence of the second intifada and the failure of the withdrawal from Gaza in 2005, which served to empower Hamas and place most Israelis within rocket range, has given rise to an aura of melancholy that is reflected in the country’s popular music. Israel is a nation torn between its deeply rooted belief in peace and the increasing remoteness of its possibility—and haunted by the ever-growing number of names etched on the walls of her war memorials. A recent trend in Israeli popular music is to set the letters of fallen soldiers, some decades old, to music. The poignancy of these songs is overwhelming. Even after listening to them dozens of times, one cannot help but cry. The tears are not just for the loss of the soldier whose poetry remains so relevant long after the words were penned, but also for the decades that have elapsed with no positive change in the matzav. As the political situation remains insecure, many Israelis are moved by the words of long-dead soldiers who are no different than the young men and women who are fighting today. The Idan Raichel Project released one of the most popular songs in this genre, “Mother, Father, and Everyone Else” in 2011. The song was recorded as part of a Galei Tzahal project, “Soon We Will Become a Song,” which gives recording artists the opportunity to sing the words of fallen soldiers. The project has released new songs every year on Memorial Day since 2002. Raichel’s heartbreaking song was written by Reuven Politi, a soldier who was killed in battle during the Yom Kippur War. He was 19 years old when he died; and in an interview with his surviving comrades and siblings conducted shortly after the song was released, it is clear that his death is still agonizing to those who loved him. Do you know, mother, what our eyes behold? And believe me, there is no pear here and no flower. And we will sleep in our clothing in bed. Yes, mother, it is important, it is difficult and it is terrible. And doesn’t touch the black horizon. In May 2014, just one month before the brutal kidnapping and murder of three young boys that marked the beginning of this past summer’s Gaza war, Noam Ambar’s song “Last Will” hit the airwaves. The song was produced through a project called “These Are My Brothers,” in which enlisted soldiers turn letters from deceased soldiers into songs. The lyrics were composed by Tzvi Grienberger shortly before he was killed on May 24, 1948 in a battle to liberate the Old City of Jerusalem during the War of Independence. Grienberger emigrated from Czechoslovakia prior to the founding of Israel and enlisted in the army. During the war, he was seriously wounded; but once he was out of surgery, he demanded to be sent back to the battlefield. The melancholy fatalism of Grienberger’s words combined with Ambar’s haunting performance is emblematic of Israel’s current popular music—and its national culture as a whole. In the shadow of Operation Protective Edge, a war that has been followed by reports of widespread PTSD and three suicides among soldiers, as well as escalating terror attacks, Israel’s radio stations tend to broadcast somber music. The news reports that punctuate the hours tell of more terror attacks, more international condemnation, more anti-Semitism in Europe and North America. Over and over, refrains of hatred are shouted at Israel, and in return she sings the words of fallen soldiers. Israel sings of peace, but is losing faith in its possibility. Israel sings of bravery, but without glory. Israel sings kaddish for its fallen, but will not stop falling on the sword of national defense. It is the anguish of 67 years of war and loss that sings Israel’s songs these days. Your heart beats in the ground.